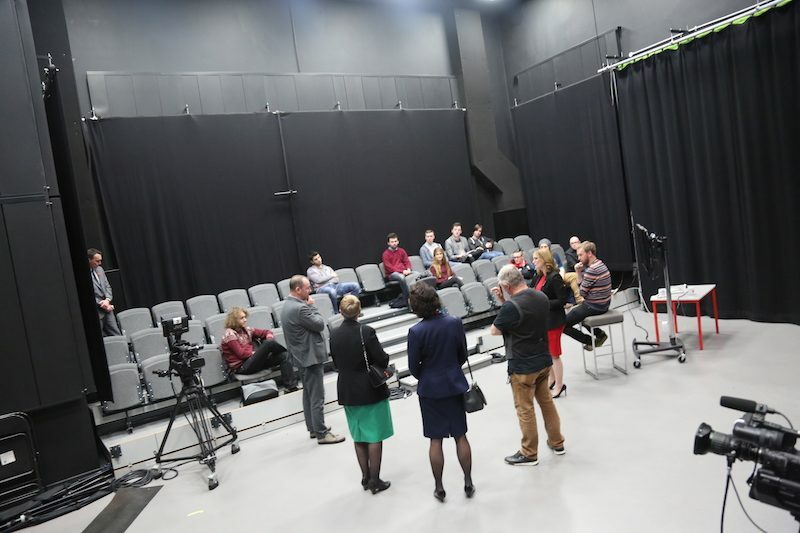 Wrexham Glyndwr University unveiled a new social enterprise degree and showcased its cutting-edge creative media centre during a visit from Wales’ Cabinet Secretary for Education. Kirsty Williams spent time with representatives of the University’s North Wales Business School (NWBS), Students’ Union and School of Creative Arts on Friday 10 November. Following a tour of the £5million Centre for the Creative Industries, the Minister met with Professors Chris Fortune and Chris Jones, head of NWBS, to discuss the recently-launched BSc Social Enterprise degree. Ms Williams has been journeying around the country’s HE institutions and said she was “delighted” to learn more about the achievements of Wrexham Glyndwr University. “I have spent much of my first six months in post hearing all about the issues facing the education sector in Wales, so I was naturally delighted to learn more about some of the exciting work going on at Wrexham Glyndwr,” she said. “I was particularly excited to learn more about the practical study the North Wales Business School is carrying out on the work of social enterprises across Europe, together with partners in other countries. During her time in Wrexham, the Minister also spoke to members of the university’s new Students’ Union, which was named Small and Specialist SU of the Year at the NUS Wales Awards 2016. CEO Sarah Ellis, President Emily Karim and Vice President Travis Davies were on hand to explain their vision for the future, before Ms Williams enjoyed a walk around the Centre for the Creative Industries with Mike Wright and Alec Shepley, head of the School of Creative Arts, which was ranked number one in Wales in the Guardian University Guide. 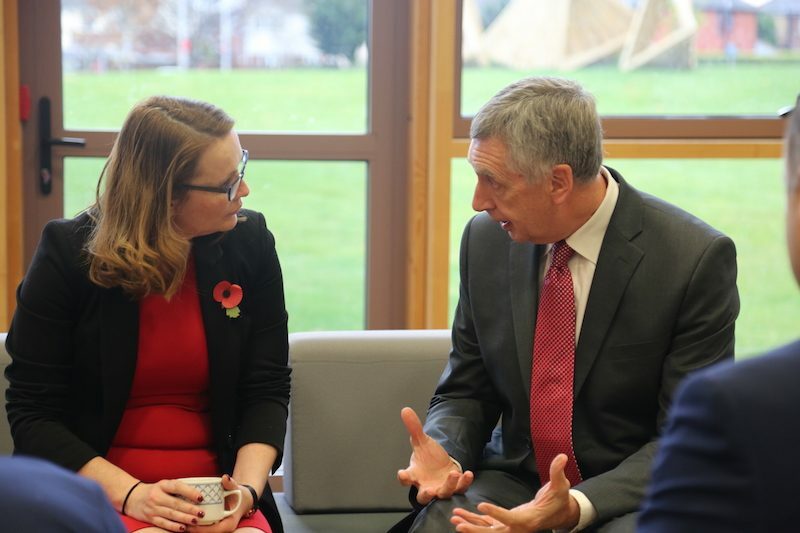 Welcoming the Minister to Wrexham Glyndwr University, Vice-Chancellor Professor Maria Hinfelaar said it had been an opportunity for the institution to demonstrate its commitment to its students, business and the community. “I would like to thank the Minister for visiting us today and taking the time to find out more about the amazing work that goes on here at the University,” said Professor Hinfelaar. Earlier this year, Wrexham Glyndwr University was awarded a £230,000 grant to study social enterprise practices across Europe, with the aim of identifying factors that are significant in their development. Professor Fortune, head of research at NWBS, said the ERASMUS+ initiative will see them work together with partner institutions in Italy, Ireland, Spain, Lithuania and Poland, and thanked the Minister for her support. “This EU project will underpin the new BSc (Hons) Social Enterprise degree that is due to be delivered on a full and part time basis from next September,” he said. The two-year scheme aims to help internationalise the new programme’s curriculum but will also develop European links with social entrepreneurs which can only help develop real skills in the students graduating from the new programme. More information about available courses at Wrexham Glyndwr University can be found here.